‘VoIP’ has become a buzzword when talking about business telephones of late. But VoIP is more than just a funny sounding acronym; it represents a huge step forward in business telephone communications. Which VoIP phone should I use? Quick Definition: A VoIP phone is a device that uses the internet instead of a pair of direct connect copper wires. 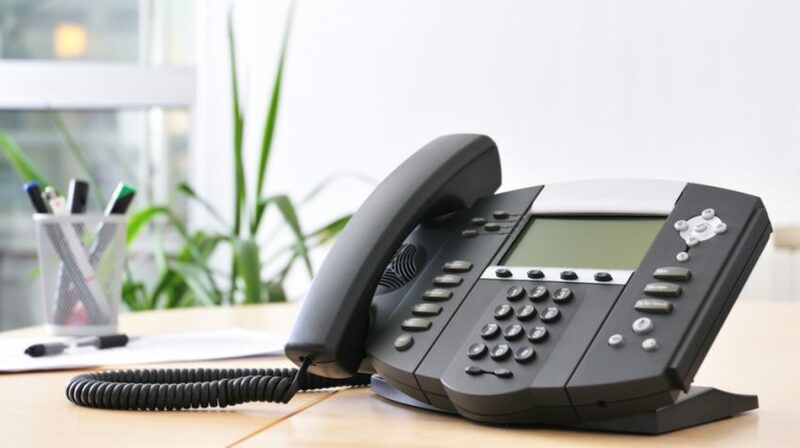 VoIP phone systems give you almost unlimited options for mobility, interoperability, and connectivity. Simple integration with other software applications. This article will focus on how to choose the best equipment for your needs. We will be covering the types of VoIP phones available, how VoIP phones work, features, and how to compare devices to make the best choices for your business. Softphones – Softphones are virtual phones that live in an app on a device (such as a computer, tablet, or smartphone) and can also be used much like a hard phone. We will be talking about the many options for softphones in a future article. In the past, phones were wired to an on-premise PBX (Private Branch Exchange). This bulky machine would handle all routing and ensure each call reached its proper destination. VoIP phone features far exceed those available on old PBX systems. 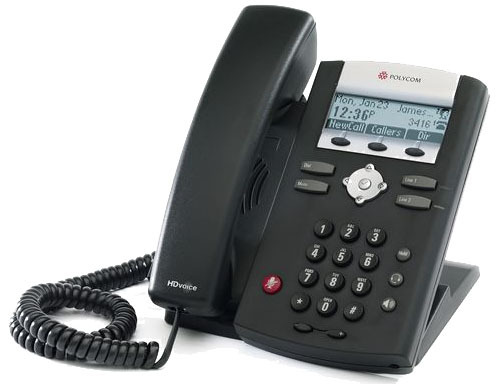 Since VoIP phones process telephone calls via the Internet, or the cloud, the technology employs existing computer network cabling or WIFI to access telephone networks. No additional copper wiring is needed to use your VoIP business phone service. Your phone number can stay the same as before, so there is no expense in changing it. Because of this, making a VoIP phone call is simple. Just pick up the handset and dial a number. The technology is designed to make it simple, not more complicated. This same idea applies to receiving a VoIP phone call. It’s the same as any other call. 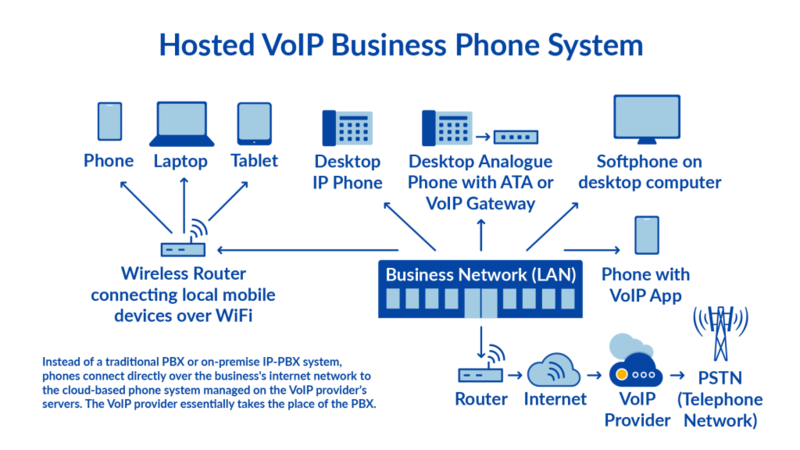 So whichever telephone device your company chooses, you can connect it to the VoIP phone system simply and easily. Just plug the phones in and have your tech team configure the system in a way that best suits your particular needs. If you use a VoIP phone system like Nextiva, we will happily help you configure everything for free. Instead of the 6-pin RJ-11 phone connectors VoIP phones plug into 8-pin RJ-45 jacks. These RJ numbers are not droid names, but are actually the connectors your computer uses to connect to the internet. Both the RJ-11 and RJ-45 look very similar. To the average person these connectors would simply be called ‘phone jacks’ or ‘ethernet cables’. But in reality they serve two different purposes. The RJ-11 is designed to connect analog phones, while the RJ-45 is designed to connect networks. To learn more about the difference between analog and VoIP read our blog post VoIP vs PSTN. Most VoIP phones need only a network connection or router. Some newer models might not need cables at all and can connect to your network simply through WiFi. Look at this phone’s bottom! No mystery here… Plug in the network cord, power jack, and you’re done! Now the bonus! 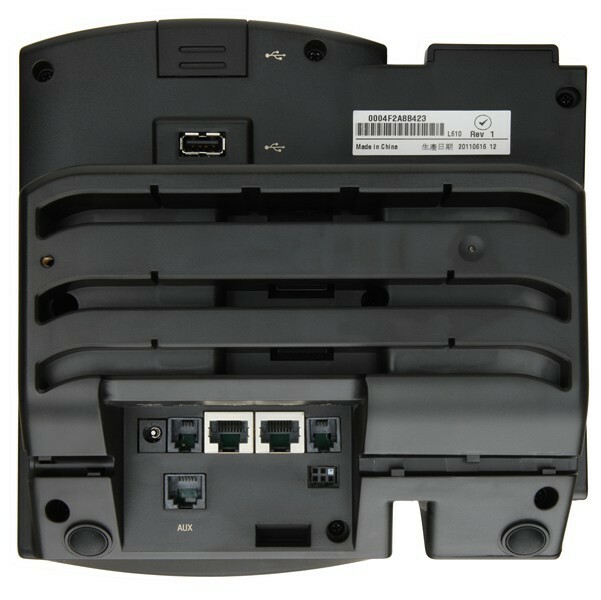 Take a look at the second port. You can plug in another phone and chain two phones together on the same network wall jack. This means you won’t have to deal with messy, big bundles of cables running to routers under your desk. Make sure you use the correct cables, though, so that you can get adequate connection speeds. 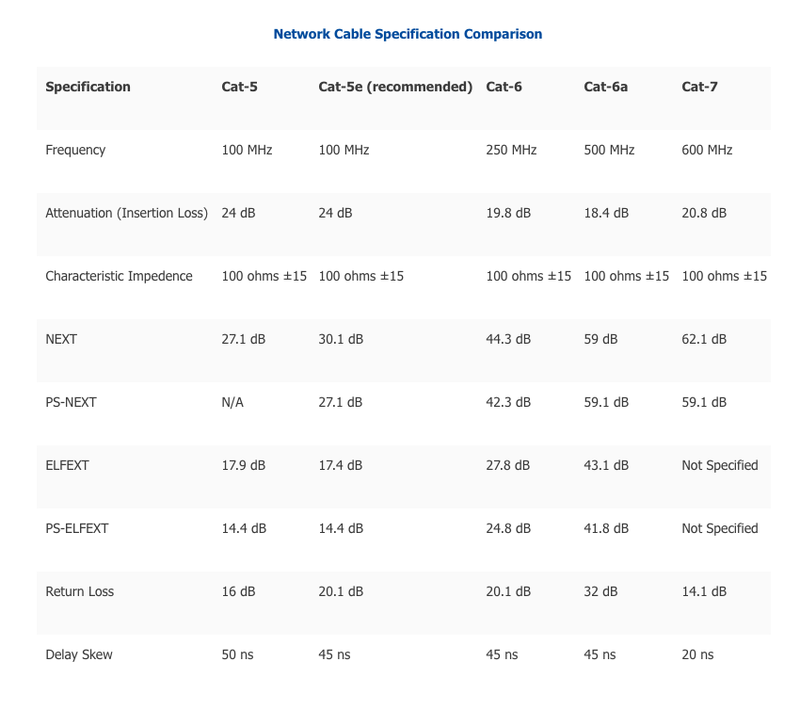 For exact specifications on the different cables available, refer to the chart below. Read the category designation on the side of the cable to find out if your cables and jumpers are adequate for your current infrastructure.SPOT HISTORY LESSON: It was a widespread practice to use old standard CAT-5 cables when the computer revolution began, but now those older cables can’t handle faster speeds. Upgrading to a minimum of CAT-5e—or better yet CAT-6—will fix this. VoIP phones use your existing Internet connection. Other business phones require dedicated copper wiring separate from the computer network connection. VoIP phones link to user accounts, not to phone numbers. They allow you to switch between simultaneous calls on a given account. VoIP phones give companies easy access to advanced voicemail features. VoIP phones have higher quality audio range (twice that of traditional). VoIP phones can be set up for PoE. That means they get power over their Ethernet network cable instead of a traditional power adapter. This results in fewer transformers having to be plugged into power strips around the office. Now let’s look at a typical VoIP phone and examine its functions and features. 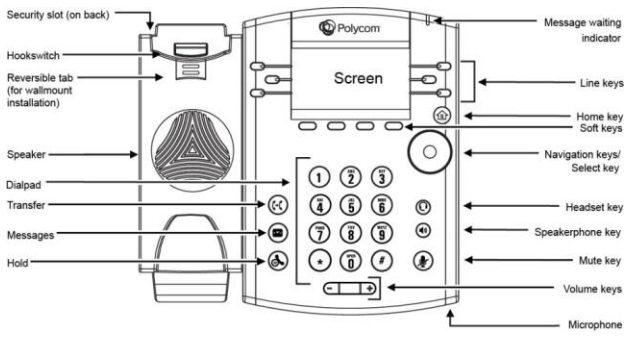 This is a general description, but we will use a diagram of a Polycom phone. So the specific functions and button locations will differ slightly with other models. You will need to understand the wide range of options to make the best choice for your business. Speaker – Where the sound comes from when in speaker phone mode. The quality of a phone’s speaker is important for effective communication. Dialpad -The standard number arrangement used for dialing. Transfer – Allows you to send the caller to another user’s phone. Different from call forwarding in that it is designed to be used after someone has answered the phone. Warm Transfer–allows you to have caller hold while you check the destination number recipient. Blind Transfer–allows you to send the call over to the new device without first checking if they will answer. Messages – This button gives you quick access to your waiting voicemail. Sends you to your voicemail where you can get access to all the advanced features of VoIP voicemail. Hold – similar function to the hold buttons we all know and love. Screen – This will vary between models; there are now many devices with full color touch screens. Higher end phones employ touch screens like smartphones that can replace some or all the buttons on the device. Usually these buttons light up to remind you when there is a call waiting or parked on that line. An easy way to identify the number of lines available on this phone, count these buttons. Often these buttons can also be programmed with speed dial access to your important clients. Home key – Sometimes as you search through the options on your phone, you will need a shortcut to go back to the beginning. Soft keys – These keys will change function based on the context of what you are currently doing. Usually the display will tell you what it can do for you. Here is a list of generally available options you might see on the display for the soft key. These options are displayed when the phone is active (when the phone is off the hook or engaged in a call). These are displayed when the phone is idle (when the phone is on the hook). Navigation keys/select key – Use these to navigate the display, like a mouse or joystick. Directions correspond to the on-screen menus: up/down to scroll through contacts, left/right to choose options like a ring type for each contact, etc. Headset key – Switch to your headset if equipped. Speakerphone key – Impromptu conference calls and hands free so you can multi-task. Mute key – Used to mute the microphone so a quick confidential comment can be made, or if you want to make an espresso during a conference call. Microphone – Often a tiny hole in the case that picks up sound on your end during a speaker phone conversation. Now that you better understand both how VoIP phones work and what they can do to improve your business communications, it’s time to select a phone model. This can often become a daunting task when you realize that there are hundreds of devices to choose from and more than a dozen brands. To make the decision process easy, Nextiva has assembled a chart showing the most popular phones on the market. All of these models have been tested and reviewed, and each has upheld to the highest industry standards. Remember, though, that there are countless other models available (some with either more advanced features or additional lines). To view a more comprehensive list of devices click here. Note that if you need a business conference phone it will be handled in the next section. Look at the brands. Are there names you trust more than others? Think about service too. Do they have a convenient and reputable service arrangement? Polycom is the global leader when it comes to productive and effective engagement with colleagues, partners, customers, and prospects. You can’t look at a serious VoIP solution without including their product line in your decision-making process. Cisco is the big name in business networks and internet infrastructure and another lead player in the VoIP hardware realm. Panasonic is one of the world’s leading innovators in VoIP phone business systems. Their reputation for making quality electronic devices goes back decades. Vtech is the world’s largest manufacturer of cordless telephones and well known for its electronic educational toys. Now look at the first row labeled – Line Appearances. 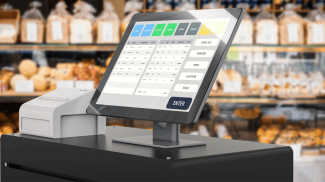 How many lines does each device in your business need to be able to handle? Do you or your receptionist already use headsets? What type of connector does he or she have? An RJ-9 is a small telephone type while the 2.5 mm is a small round jack. If you need Bluetooth, then make sure your device supports it. Is PoE important to you? Then make sure the device you pick has that capability. Don’t forget about future needs. Try to predict what you will need in a year or even five years. Is this device going to be able to handle healthy, realistic growth? Whatever you choose, be comforted by the fact that VoIP is more scalable and flexible than any phone system of the past. A conference phone differs from a desktop phone in that it is optimized for both hearing and sending the best quality audio in a group setting (like a conference room table). Conference phones are designed with omni-directional microphone configuration. 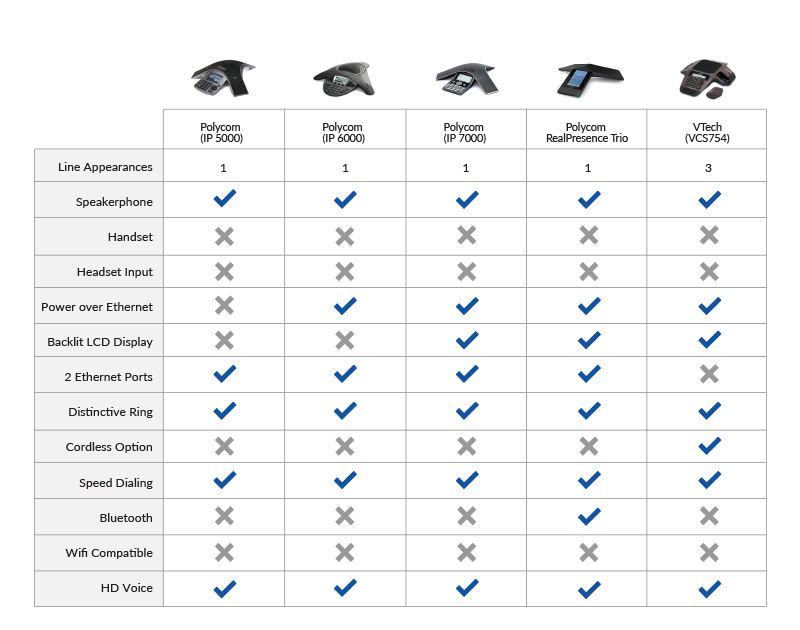 However, there isn’t a big functional difference between a desktop phone and a conference phone. If you learn how to use one, you can easily use the other. The models shown below are among the most popular in the market. Each comes with standard features like speakerphones and speed dialing. For information on additional features and capabilities, refer to the chart below. Or you can explore other models here. Notice the option for going cordless. Many conference rooms don’t have a network jack in the middle of the table. If you want to avoid running another cable, this could be an important choice for your device. Bluetooth might be important too. Especially if you need to boost the sound for someone with a hearing impairment and not make it uncomfortably loud for others in the room. The display is further away from the user, so a brightly lit readable display could make a difference. 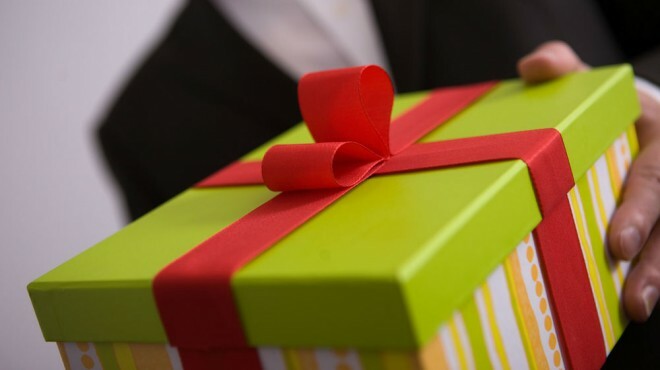 Importantly, take note of the reputation for quality that each brand represents and look at their customer service rating. Lastly, a coffee/espresso maker option is not yet available on any model. Perhaps we should start a write in campaign? There are many choices when buying and configuring your business VoIP service. Making sure you have the best VoIP provider, the best phones, and the best features at the best price means making intelligent business decisions based on facts. The good news is that you are not alone in this journey, and there are professionals to guide you along the way. 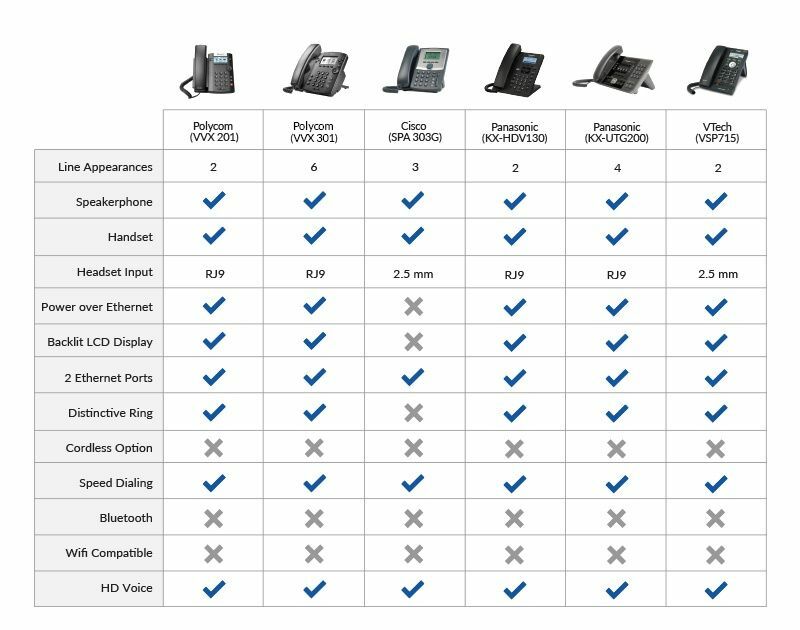 Let Nextiva‘s VoIP specialists help you select the perfect phone system for your company. 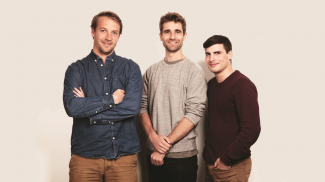 Our support team will be happy to walk you through various phone options available and how to configure them to meet your specific business needs. I have been using VOIP phones for around 7 years now and will certainly not be going back. What is great is that you can just unplug the telephone from one location and then plug it in somewhere else and it continues working with the same number. VOIP opens up a whole range of new possibilities at a fraction of the previous cost. This becomes especially useful if you have clients in other countries. This will allow you to reach them no matter where they are in the world.